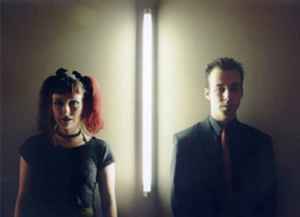 Based out of Canada, Epsilon Minus (Bogart Shwadchuck, electronics and design) debuted on Alfa Matrix in 2002 with a self-titled disc of EBM and techno-pop, created with little more than a mod tracker and a single synthesizer, fronted by vocals from Jennifer Parkin. In 2003, Epsilon Minus returned with Mark II, exploring alternate directions in electronic dance. In 2004, Bogart is perfecting his blend of EBM, techno, and trance with the Pre-Initialized EP and the Reinitialized LP. Influenced by the relentless minimal rhythms of techno and the swarming synthesizers of psychedelic trance, Epsilon Minus engineers pulsing dancefloor tracks, with detours into techno-pop and intelligent dance. The new sound is accented by collaborations with vocalists from such bands as Azoic, Distorted Reality, Null Device and Stromkern. Epsilon Minus was announced defunct by Bogart Shwadchuck in January 2005.